Landing pages support content marketing. The tricky thing is … landing pages are not home pages. They’re not blog posts, cornerstone content, white papers, case studies, product description pages, or even sales pages. And you can’t treat them like they are. High-converting landing pages consist of three action-driving stages: before, during, and after. Tragically, when many content marketers build landing pages, they focus on just one stage: during. But if you don’t invest effort into what happens before and after you present your landing page, it doesn’t stand a chance of achieving the results you want. While landing pages are not about you — your company, your product, or your service — the “before” stage is because you first have to establish your goal. Naturally, there are plenty of other actions that might be the goal of your landing page. Whatever you select, your goal should be singular: the one desired action will guide everything else. For example, let’s look at InvestorCarrot’s landing page for their SEO Keyword Bible. The crucial thing to notice isn’t what’s on the page, but what’s left off the page. There’s no header navigation, no footer, no social media icons, and even their logo in the top left corner isn’t clickable. InvestorCarrot knows exactly what they want their visitor to do and they eliminate every other navigation option. The result of this singularity — along with other factors I’ll address in the next two stages — is a whopping 45.89 percent conversion rate. Take heed: when it comes to planning your landing page — the before stage — select one goal. Remove anything that doesn’t support that goal. The “during” stage of your landing page consists of five on-page elements. The headline of your landing page is arguably the most crucial on-page element. Why? Because while 8 out of 10 people read the headline, only 2 out of 10 will read the content that follows. So, how do you create a headline that grabs, compels, and drives action? Instead of trying to create the perfect headline, steal it. First, steal the heart of your headline by building it around your audience’s own keywords. Whether you drive visitors to your landing page with paid advertising (PPC) or organic search, your headline must include the words your audience uses. This is precisely what makes our previous example so compelling. Instead of including vague keywords about SEO, the headline targets a specific audience: Simple SEO ‘Hacks’ To Help Real Estate Investors Get More Traffic & Leads. Next, steal successful headline templates. Copyblogger’s How to Write Magnetic Headlines ebook is a great place to start. You can also steal from my own 25 heaven-and-hell-themed headline formulas or go even more in depth by diagnosing your audience’s “state of awareness” and then systematically crafting breakthrough headlines from inside your market’s mind. With all the information that bombards us on a daily basis, most of us scan content. The subheads on your landing page should not only structurally guide your reader through your major points, they should stand alone and relentlessly focus on the benefits of your call to action. Remember that what the headline does for the page itself, subheads do for each section. This means making your subheads enticing, bite-sized nuggets of “I just gotta keep reading” copy. A fantastic strategy for building compelling subheads is to make a list of all your product or service’s features … and then transform those features into audience-centered benefits. It’s quickly ready to start cooking your lasagna. Your food is on the table sooner. Just like every other on-page element of your landing page, effective body copy does not come from you … it comes from your visitor. Your aim should be to unearth the very words your audience already uses when they talk about your product or service. So while you must speak to the heart of your visitor, you also need to provide proof for their heads. They aren’t framed in a problem-then-solution format. They don’t highlight measurable results. Brogan’s testimonial nails exactly what’s wrong with most content management systems — the problem — and then explains exactly how the Rainmaker Platform addresses those deficiencies for him — the solution. How do you generate your own proof-producing testimonials? The call to action (CTA) is copy that asks your visitor to take your desired action. CTAs will commonly appear throughout your landing pages and at the very end. To write your CTA buttons, you can follow Joanna Wiebe’s masterful advice. So far, we’ve covered quite a bit of ground. However, we’re not done yet. Because even if you create a high-converting landing page with all the right on-page elements relentlessly driven by your own all-consuming and singular goal … and even if people are actually taking the action you want them to take, the job of your landing page isn’t finished. In fact, if you stop there, all your work could be for nothing. The most neglected element of every landing page ironically isn’t even on your landing page itself. When standard “Thanks for signing up” pages and “Click here to confirm” emails are off-putting, they squander the momentum you’ve worked so hard to create. What should your follow-up look like? Here are two examples. Let’s look at InvestorCarrot’s landing page again. After signing up for the SEO Keyword Bible, the new lead is redirected to the page featured below, which offers immediate access to the report itself. Immediate access is vital to keep the landing page’s momentum rolling. In addition to offering immediate access, the page also presents the user with two videos about the report as well as the opportunity to deepen her relationship with InvestorCarrot by signing up for a live webinar. Your own follow-up doesn’t need to have as many options. Whenever someone signs up for my Content Creation Checklist, I send him this conversational follow-up that includes tons of white space, one link to click, and ends with a question. Give your visitors immediate access to whatever they’ve just asked for. Write to them like one human communicating to another. When you build landing pages with these three stages, they are hinges that transform visitors into actual leads: real people with real problems in search of real solutions. Don’t make the mistake of just focusing on what’s on the page: the during. Start by selecting one goal and one goal alone: the before. Then, don’t drop the ball after all your hard work. Customize your follow-up and keep it rolling: the after. Oh, and be sure to share in the comments if you’ve got a tip or landing page of your own you’d love for me to check out. However, be careful … I just might actually take a look. You have hit every nail on the head here. I knew all this. But have never seen such a coherent and clear presentation of all these elements in one good article before. Clear, easy-to-read explanation! Very helpful. Thank You. Love it! Thx so much, Bob. Excellent advice Aaron! While I’ve started and run several traditional businesses, I am somewhat new to the online marketing arena. I have been challenged with gaining conversions on my landing pages and now I have a better understanding as to why. It appears that I’ve been focusing on just one part of the equation (the opt in), while neglecting the before and especially the after parts. Thus piece forced me to refocus and retool to better meet my goals in this area. Thanks for the information and supporting links within. You’ve provided a little “golden nugget” of advice from which nearly all marketers can learn. Thanks for putting this together! That’s exactly what I was hoping for … esp by highlighting the two neglected elements. Let me know if you put together a “before and after” version of your own landing page. I’d love to check it out. I love the 3 stages you’ve highlighted, its more personal and specific. Giving visitors immediate access to whatever they want, can really boost trust and loyalty towards your blog. Thx Bill … naturally, I whole-heartily agree. I HATE when I have to jump through hoops (wait for the first email … confirm … wait for another email … follow a link … then click “Download”). 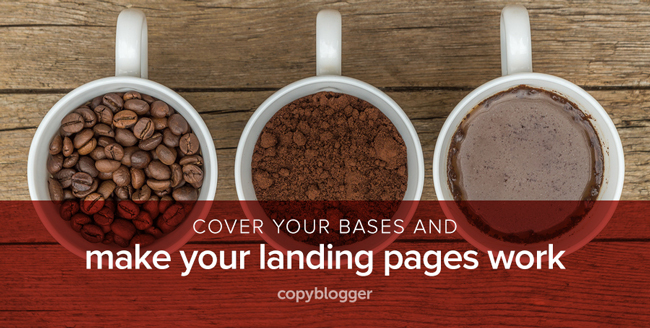 Landing pages are a huge part of successful content marketing. Pulling potential readers and clients is what it’s designed to do. I think stealing some great ideas is always a good idea however, make the content your own. I absolutely agree … steal, steal, STEAL! I’m adding my kudos to the pile: what an informative, yet easy-to-read article! Also, I applaud your practice of giving prospects that handy checklist, even if they may not use your services. Glad you liked the checklist. Let me know if it’s helpful for you. Awesome stuff as always Copyblogger and Aaron!! And really cool seeing Carrot mentioned in here! I’ll tell you what, the part about not stopping at the opt in and delivering a great post opt in experience is HUGE. Too many people stop at the opt in but the money is really made after that happens. Great insights as always. This is a great, very helpful read. Cheers! Cheers to you, Pieter … thanks for reading and commenting. And I know exactly what you mean. Having signed up and tested it out, I was SUPER impressed with Carrot’s follow up process … esp. the “extras” and your team’s amazing use of testimonials. Great post, Aaron. I love how you’ve focused on the three stages – especially the after stage seems to be forgotten so often; but that’s where you start building a relationship with a email subscriber or customer. Wow … I’m always happy when I see a comment from you, Henneke. That simple trick you provided with the “So what?” questions is incredibly helpful. And yes … totally agree about the after process. Hi Aaron, That’s a concise script for a great conversion strategy. Great work! Hmmm … I think there might be a great title in that comment: A Concise Script for Conversion Strategy. Wow this is a really great post! I think the “Stealing Headlines” idea is so good. It really makes you think. I try to encourage “healthy” theft whenever possible. Always appreciate kind words. Thanks for the comment! Exceptional content as per usual Aaron. So easy to understand. Thank you! Well … speaking of “as per usual”: thanks as always for your awesome support and kind comments. As someone who has never ventured into the world of ‘landing pages copywriting’, I enjoyed this insightful, inspiring, and information-rich article – this has to be one of the best introductions to the world of landing pages!